The global mica market is led by companies such as The Premier Mica Company, Ashville-Schoonmaker Mica Company, and Mica Manufacturing Co. Pvt. Ltd. Large-scale manufacturers have easy access to raw materials owing to their integrated operations, thereby boasting a competitive advantage over other companies. The business dynamics depend on goodwill of companies and long-term contracts. Transparency Market Research in its new study, recommends companies to invest in R&D for introducing new and improved products in the market and also focus on the production of customized products by assessing the needs of customers. Numerous substitutes for mica are available in the market, including acrylate fiberglass, polymers, nylon, cellulose acetate, phenolics, and fish paper. These substitutes can replace mica for its filler, electronics, electrical, and insulation usage. Thus, the threat of substitutes will be high in the coming years. 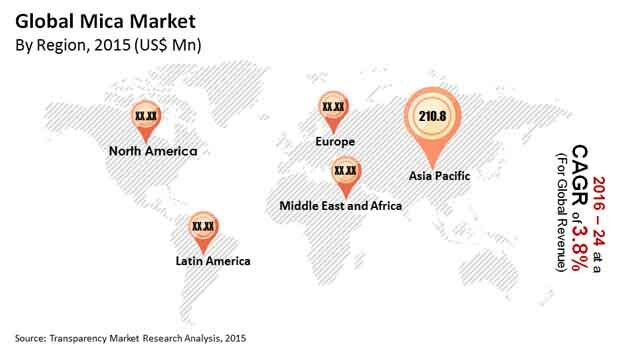 According to the report, the global mica market is expected to rise from US$478.1 mn in 2015 to US$669.3 mn by 2024. The Asia Pacific region led the mica market in 2015 and this trend is anticipated to continue through 2024. The growing electronics industry in Asia Pacific has led to an increased demand for mica. China is a key producer and consumer of mica in the world and is thus, behind the growth of the market in Asia Pacific. By form, the natural mica segment will continue to remain dominant and account for 88% of the market by 2024. On the basis of grade, the ground mica segment is expected to lead in the coming years and is projected to be worth US$359.3 mn by 2024. By end-user industry, the electronics segment is most likely to lead and is estimated to be worth US$183.7 mn by 2024. Mica is used as an additive in the paints and coatings industry to improve product luster and in the construction industry for joining cement in damp-proof seals, asphaltic roofing, and gypsum boards. It is also used in the cosmetics industry and in the manufacturing of toothpaste. Thus, the demand for mica from these industries is expected to boost the market in the coming years. Mica can also be used as an insulator and since it has the ability to remain stable even when exposed to light, heat, electricity, moisture, and other extreme conditions, it is extensively used in the electronics industry. One of the factors hampering the growth of the market is the serious health issues caused by mining. Workers on a mining site can suffer from various chronic diseases and thus, governments across countries have laid various rules to curb health hazards and pollution at mines. This can affect the global mica market because there is no other way of procuring mica except mining. Research and development and technological advancements are likely to increase the probable applications of mica. “As mica is extensively used in the electronics industry, there is a strong chance of mica being used in the field of robotics in the not-too-distant future,” says a TMR analyst. This is expected to widen the scope of the global mica market and provide lucrative opportunities for players. Moreover, the growth of the construction and electronics sectors will continue to ensure high demand for mica in the coming years.